Check out my closet!! | ARTZCOOL'S BLOG! 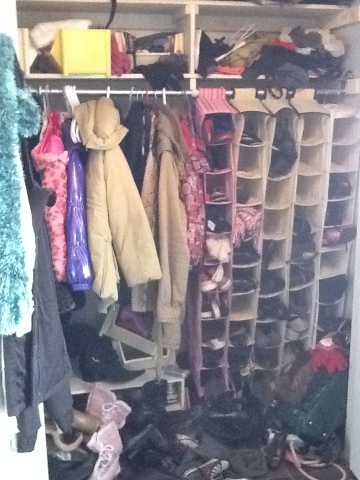 We are lucky enough to have two large closets in our foyer. 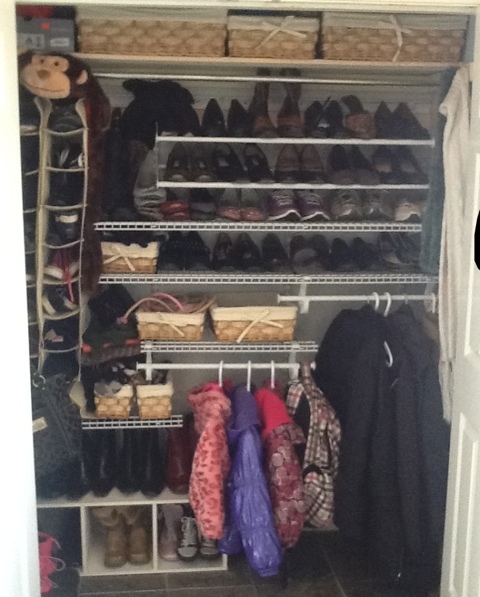 When we moved in, we decided the girls (my daughter and I) would share one closet, and the boys (my husband and son) would share another. Obviously, I didn’t think the deal through, because the number of shoes (and coats and accessories) my daughter and I have greatly outnumbers the number of shoes the boys have! Anyways, when we have had people over the last few months, I take their coats and shove them in the closet and close the door as fast as I can. I’m going to share with you the skeletons in my closet… For all you know, there could be skeletons, take a look! But now, I am going to prop the closet door open to make sure everyone that comes to our house sees it! 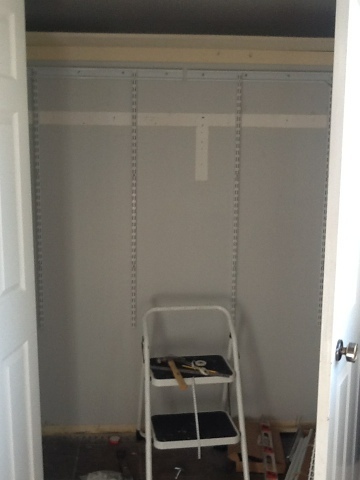 I started the closet project the way I do most of my projects… I aimlessly wandered the aisles of Home Depot! I came home yesterday feeling a little overwhelmed, but I bought a closet system, plus about a hundred and fifty dollars worth of extra shelves, and baskets (because of course I didn’t measure or plan anything out before going to the store) but, I have about one hundred dollars worth to return next week. The best part is I somehow managed to fit everything back in! I did use this opportunity to sort through everything and get rid of a few pairs of shoes and a few coats as well. Happy family day everyone! Only three more weeks until March break!!! Sounds like you had a busy family day at your house……….that will certainly make it easier for everyone to get out to school in the morning…enjoy your new closet………from Hanover, On! 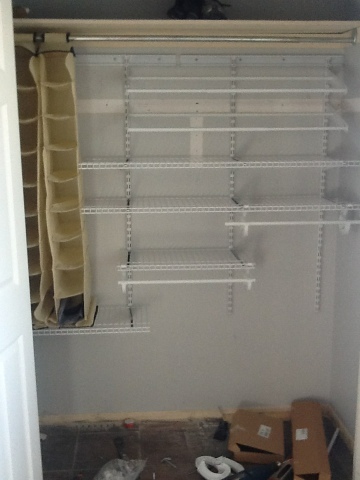 Great job on the closet! This is a project I will be working on soon myself.